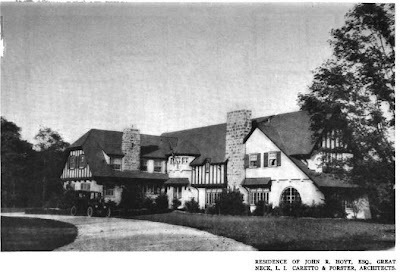 The John R. Hoyt residence designed by Frank Forster of Caretto & Forster c. 1920 in Great Neck. 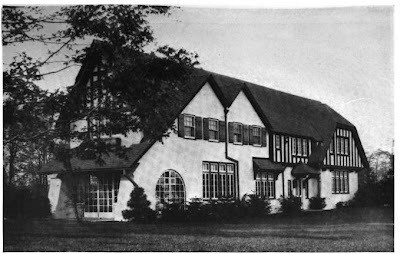 This was Forster's first commission on Long Island. Hoyt was involved in real estate and was the president of the New York Chapter of the American Institute of Real Estate Appraisers. Click HERE to see the house on google earth (it has since been enlarged). 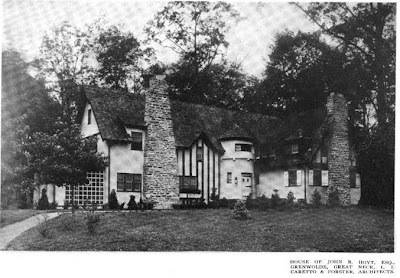 Pictures from Architectural Record, 1921. Is the second picture down the same house? 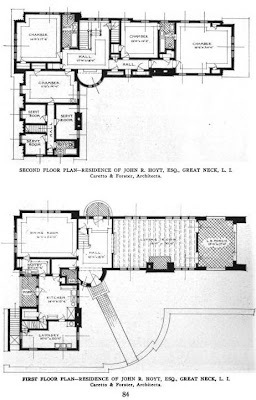 Doesnt seem to fit the floorplan. It might be an outbuilding. Odd. The first 2 pix are the same house and do belong to the floor plan although there are some window changes. But the 3rd pix is not the same house and maybe a guest house. I'm sure it still exists but has been remodeled into oblivion. I'm looking at a maps.live.com image (date image taken unknown so don't know what might have changed since) and the house is on Kings Point Road just south of Dock Lane perpendicular to the intersection with Hampworth Drive.